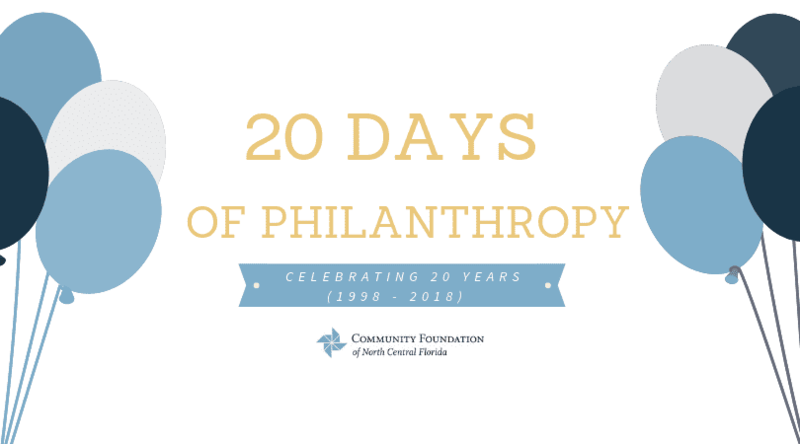 This year, the Community Foundation of North Central is celebrating 20 years of philanthropy in our community. We have grown to holding more than 100 funds from dedicated philanthropists who have given more than $20 million in grants to local nonprofit organizations. Behind those numbers are stories of people who bring tremendous passion to their giving, leveraging their creativity and strategic thinking to help organizations deepen their impact. Most importantly, their viral enthusiasm inspires friends and family members to learn more, get involved, and give. 20 Days of Philanthropy celebrates those stories. Read President and CEO Barzella Papa’s letter to our community in the Gainesville Sun here.